Gregg's awesome versatility, limitless energy and astounding collection of drums was the perfect match for Spectrasonics drum projects. Gregg's is known around the world for his powerful, and inspirational drumming, whether as a soloist, sideman, teacher or a band leader. Family and music go hand in hand for Gregg, growing up in Detroit, Michigan with his bassist brother Matt (of Trilian fame) and his band leader Dad. Gregg went on to study at North Texas State where he was featured in the famed "One O'clock Jazz Band." After college he soon joined Matt in the Maynard Ferguson Big Band. By the early `80's Gregg had relocated to Los Angeles where his ability to seamlessly fit into a wide variety of musical situations rapidly established him as a session legend. Gregg has performed and recorded with an amazing variety of artists including Santana, Joe Satriani, Don Henley, Hans Zimmer, Keiku Matsui, Ringo Starr, Gino Vannelli, Tania Maria, Brian Wilson, Frank Gambale, Carole King, Robin Zander, Yarborough and Peoples, Andy Summers, Linda Rondstat, Steve Lukather, The Mustard Seeds, David Garfield, Enrique Iglesias, Larry Carlton, Pat Boone's Heavy Metal Big Band, Toto, David Lee Roth, Tribute to Jeff Porcaro, Celine Dion, Steve Vai, and many others. One of the highlights of his career was being invited to perform with the Buddy Rich Big Band on the Buddy Rich Memorial Concert and touring the world with his idol Ringo Starr. 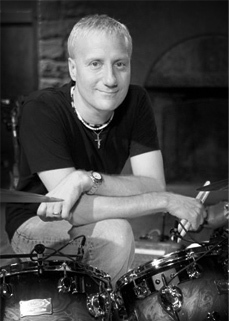 Gregg has also cultivated his own solo career with his albums, "Gregg Bissonette" and "Submarine".